Achsoooo, ja die Karten bringen halt nen Boost. Kannst glaub ich immer nur einen "aktivieren". And it’s time to boycott the PC version of Fifa 14. As we said a couple of hours ago, we were uncertain whether the PC would be getting the next-generation version of Fifa 14. After all, Ignite was announced for next-gen consoles and it has been confirmed that its PC version will be based on its ‘old-gen’ version. Yeap, EA Sports is pulling another ‘Fifa old-gen’ on PC gamers, in order to obviously promote the next-gen console versions of Fifa 14. 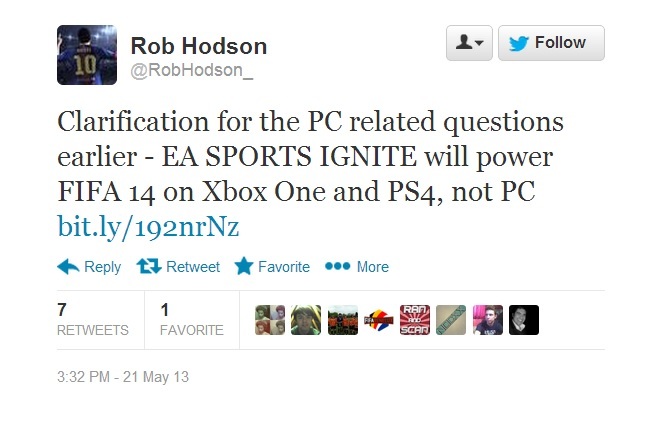 As Rob Hodson, Community Manager for EA SPORTS FIFA Series, revealed, Ignite engine is only coming to Xbox One and PS4 and not to the PC. We can’t wait for EA Sports’ excuses about this. The team will obviously state that PCs are not powerful enough for that engine – or that the majority of those playing Fifa on the PC are not using high-end machines – and that’s why Fifa 14 PC will be based on the old-gen version. This is clearly the same tactic EA Sports used with Fifa and in the current generation era. And this is perhaps the first time we recommend boycotting something. And the reason we suggest something like that is because EA Sport is simply trying to promote the next-gen consoles and nothing more. Hell, even Battlefield 4 is coming to the PC with all its bells and whistles. Truth be told, we kind of expected this turn of events. It’s just sad the way EA Sports treats the PC crowd. Bad move EA Sports. Bad move. DAs heißt Konsole kaufen oder wieder mal ein schlechteres FIFA auf dem PC zocken. Das sind so Vollidioten.